We had a great time at Callalantee this past weekend. We met at the Callalantee camp about 3pm on Friday afternoon for a short afternoon run. We ran up Green to Orange and then up what is left of Little Tellico (more on that later). We hit the Black trail that leads up to Skyline. Heading up the hill from Black to Skyline we found a couple of CJs with a bit of a problem. 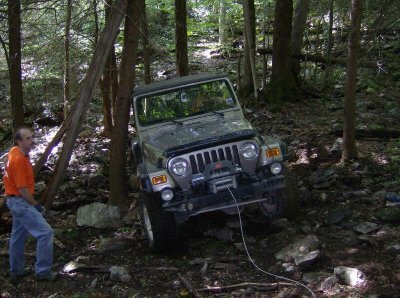 One of the CJs stalled going up the hill and while they were trying to winch it up the hill, the winch let loose and the jeep sped down the hill and came to rest on a tree. Back passenger side of the tub was crushed. We helped them strap it out of the way and on level ground it started again and off they went back to camp. We headed on down Skyline to Yellow and went up to the old tower site and played on the rocks. There are some pics of Alan and Craig on top of the world. Then back down to Red and Gold back to camp. Showered and off to dinner at Cook’s Cafeteria. Saturday morning Mike rolled in flat towing his YJ and as he was disconnecting the tow bar I asked “Is your fan belt suppose to be laying on the ground?” The answer was of course no. The bolts holding the mounting plate for the York Compressor had sheered off and the compressor was flopping around. 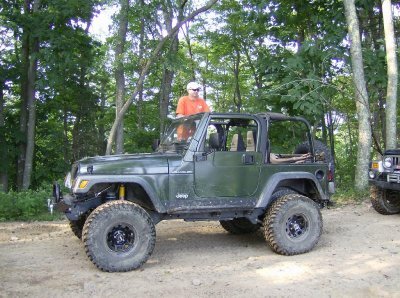 Mike took the compressor off and as he did that Craig ran to Autozone to get a standard fan belt for the YJ. Mike got the belt on and off we went. We hit Welder about 10:30. 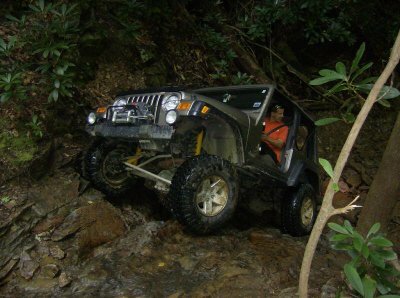 None of the jeeps made the waterfall. Sean in his truck made it but that was it. Mike managed to break what we thought was just a U joint on his rear Driveshaft. After he got it out we saw that the part of the driveshaft that connects to the rear flange was cracked where the U joint fits in. Jeremy had an extra driveshaft, Mike changed his driveshaft and now about 12:30 we were off again. Yes, 2 hours to get 6 people over the waterfall, 1 around the bypass and 1 swapped driveshaft. We ran the rest of Welder and then down Blue. 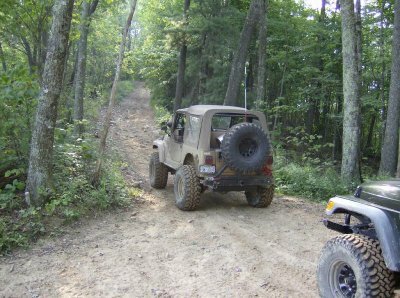 Sean and Craig made it up the very steep hill next to the end of blue and then we ran over to Little Tellico. The creek bed that used to be Armor-All had been filled in with trees and such and had not been run in a while, now Orange runs on one side of the creek and Silver on the other side. 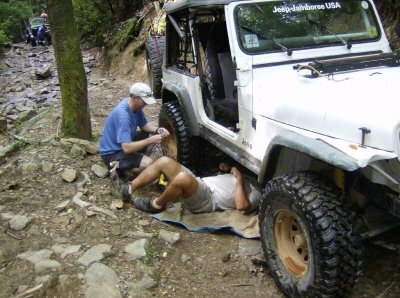 Mike and Jeremy worked on cleaning out Armor-All to a point that we can get from the entrance in the creek bed up to the bottom of Little Tellico and the Rock Garden with only one winch point. 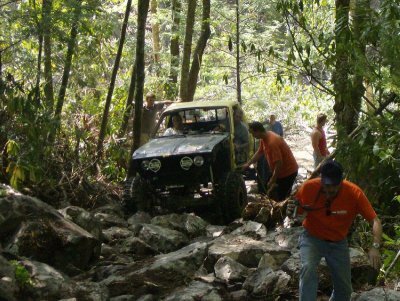 While Mike and Jeremy worked on that, Sean played on the rock garden next to Little Tellico. With some help from Craig and Andy moving rocks and spotting him he made it up the rock garden. 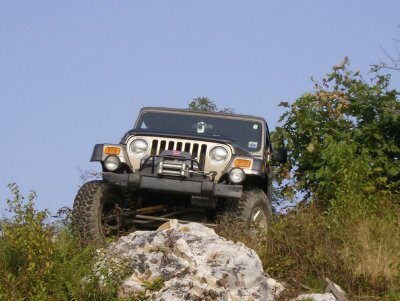 Everyone else went up Little Tellico. At the top Craig was feeling left out so he ripped his tire and had to put the spare on. Then we split into two groups. Craig, Andy, Sean and Jeremy decided to try Armor-All. Alan, David and Mike went over to Vertical, Gray and a bit of Black (until we hit the barbed wire). Then we met back at the camp, showered, changed and Craig, Doug, David, Brad, Mike and Alan went to dinner, then Mike, David and Brad headed for home. Sunday morning Craig, Doug and Alan headed up Green to Pink explored some trails that had not been mapped yet on GPS. Then we hit Helicopter pad, down Brown to Lavender (fixed a little GPS error on Lavender), then Lavender over to the Black loop and took the Black loop back to Green. 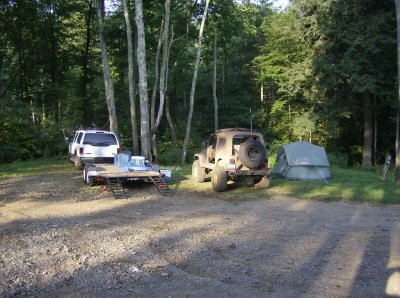 Then Alan headed back to camp to pack up and Craig and Doug hit yellow to the tower and then back down Red, they arrived back at camp about the time Alan was loading the jeep. Then we headed home. There are a ton of things to do at Callalantee. If you want to go and play on some obstacles all day there are places to do that and if you want to go and ride trails all day and see a lot of nature you can do that too. Definitely a do again…in fact we discussed that some of the easy trails with a few inches of snow and ice would be very interesting, so stay tuned we will be heading up there this winter.